Are all the best college players already in the NBA? The month of March is the outstanding time in the basketball calendar. Although the sport domestically might be winding down, often anti-climactic-ly (not really a word, at least MS word doesn’t think so), the pinnacle of the American basketball calendar, the NCAA tournament, is taking place. In April 2010, the NCAA announced a $10.8 billion, 14 year deal which gave television, internet and wireless rights to CBS Sports and Turner Broadcasting Inc. Unsurprisingly, CBS earns most of its revenue through advertising sales. Last month, CBS announced that its profits had risen by 31% for the fourth quarter of 2011 despite a dip in advertising sales. It was helped by political advertising, the syndication of the CSI: Crime Scene Investigation series as well as the success of Homeland (the popularity of which I don’t really get), which is shown on Showtime, it’s not-quite-HBO-but-almost cable channel. It is fair to say that March Madness more than pays for itself. In addition to the notional, but irritating, subscription charge that CBSSports.com now applies to online streaming, over the course of the 2010 tournament, CBS drew in $613.8 million in advertising sales revenue. In 2008, the tournament which ended with Kansas defeating Memphis 75-68, it brought a record $643.2 million to the CBS coffers. So, although $10.8 billion might be only marginally higher than the GDP of Mali (according to CIA estimates for 2011), it is fair to say that CBS will do quite well out of the deal. Others who are highly sensitive to a positive March performance are the college players themselves. While consistent play throughout the season is what attracts professional teams to them, the desire to perform when it really matters – to be seen as “clutch” – is also crucial. One college star who has seen his stock severely limited by consistent mediocrity, particularly during this seasons’ tournemant, is North Carolina’s Harrison Barnes. In 2009, Barnes held a press conference to announce that he would move from his Iowa home to Chapel Hill to pursue his basketball dreams at the alma mater of Michael Jordan. This is fairly common among elite High School players; most basketball fans in the United States, particularly post-Lebron, are aware of these kids before they even sign with a college and, if you happen to be a fan of one of the elite college basketball teams, it’s fair to say that you will have more than a passing interest in the outcome of the press conference for a player who may attend your school. The problem was, with Barnes at least, that he subjected the viewing public to something akin to his own version of “The Decision”. “As I reflect on the recruiting process, I’d like to share a few points,” Barnes began, with the logos of Iowa State, UCLA, UNC, Duke, Kansas and Oklahoma in front of him. Many players choose simply to have caps from each school in front of them, before putting on the hat which represents the school they have chosen. All this from a seventeen year old. Harrison Barnes's version of "the decision"
When the light blue (they call it “tar heel blue” in the US) clad figures appeared on screen, UNC fans rejoiced at yet another high profile recruit joining their basketball programme, but there was something unsettling about someone so young having the audacity to create such a spectacle. Barnes’s second season at UNC saw him average 17.1 points per game along with 5.2 rebounds. Not bad statistics compared with the 15.7 PPG and 5.8 RPG he averaged the previous season, when he won ACC rookie of the year honours. However, when it came to crunch time, Barnes was far from the elite player that UNC needed him to be. His last two games for the Tar Heels saw him shoot 8 for 30. He had been criticised for sporadic effort during games; combining the occasional spectacular play with lazy defensive play. He also struggled as a one-on-one player; something that was sorely evident in UNC’s Elite Eight defeat to Kansas. Put simply, Barnes could not operate at a high level offensively without injured Kendall Marshall alongside him. In particular, his inability to beat his man will pose huge problems for him at the professional level where he will encounter more athletic defenders than those he couldn’t beat at the college level. Along with Barnes, UNC will lose senior centre Tyler Zeller, rangy forward John Henson and Marshall, most likely all to the NBA. Departing (I’m not going to use the word “graduating” here because that’s not true for them all) UNC classes have not always enjoyed great success at NBA level. The 2005 vintage side saw Marvin Williams, Raymond Felton, Sean May and Rashad McCants to the NBA. Williams and Felton remain the NBA, even though the former is widely seen as a less-than-stellar number two overall pick, picked as he was ahead of Deron Williams, Chris Paul, Andrew Bynum, Danny Granger and David Lee. Similarly, the 2009 class of Tyler Hansbrough, Ty Lawson, Wayne Ellington and Danny Green have enjoyed mixed success in their professional careers. Another individual who has seen his stock collapse over the duration of his college career is Baylor’s Perry Jones III. Jones has been projected as a lottery pick ever since he was in high school. Indeed, just over a year ago, if you had looked at one of the various NBA draft sites, you’d have come to the conclusion that the 6′ 10″ Jones was pretty legit; he was a consensus high lottery choice and in many cases the prediction for first overall pick. Even after what were frankly embarrassing performances in the NCAA tournament, Jones is still the tenth pick on draft express’s website. Perry Jones: destined to be an NBA flop? The thing about Jones that intrigues potential employees is that he is effectively a seven footer with the skill to play on the wing. In a sense, the poor man’s Kevin Durant. It has been mooted that Jones simply lacks the work ethic that is necessary to truly succeed. Hard work outworks talent when talent doesn’t work hard, if you will. Or, to put it another way, if you don’t get it by the time you’re in college, you never will. During January, Baylor faced Kansas. Jones jogged through the tunnel and a middle-aged man yelled at him, calling him a “second rounder”. Baylor lost both of their regular season games with Kansas, although they exacted revenge during the Big 12 championship. In this particular game, Jones led Baylor with 18 points but was eclipsed by Thomas Robinson, the Jayhawk big pouring in 27 points AND hauling down 14 boards. Jones only claimed 5 rebounds. It’s stats like that which have prompted many to call him soft. Over the season, he averaged 13.5 PPG and 7.4 RPG, which isn’t bad, particularly when you consider Baylor has five players averaging double-figure points per game. His field goal percentage is a nice round 50% and he even shot just over 30% from the arc. His 69% free throw success rate, however, will provide fuel for his critics, who have even questioned his decision to attend Baylor. Jones graduated from Duncanville High School and attracted attention from powerhouse schools such as Kansas and North Carolina. His decision to attend Baylor raised eyebrows, but ignored the fact that his mother, who lives in Dallas, was battling cardiomyopathy, a serious heart condition which may necessitate a transplant. Jones’s character in coming through this, not to mention accusations of receiving improper benefits from Baylor (a recent ESPN article on his notes that he was in fact offered money to attend a rival Big 12 school), will undoubtedly stand him in good stead in the future – he has even improved his grades since arriving in Waco (he tweeted his pleasure at achieving a B in one class and was instructed by his followers to “get back in the gym”). However, given the amount of money that he is likely to earn in the next couple of years, it will be his performances on the court which will continue to draw the most public attention. The fact that he still sits towards the top of the 2012 draft boards emphasises just how weak this draft class is going to be. Players can enter the draft and withdraw their names, provided it is done before a set date, this year June 18th, and they don’t hire an agent. Jones may yet return for a third year at Baylor, but he will do so in the knowledge that his stock, from a professional point of view, might not rise much higher. If he wants to earn big money, he may need to leave Waco this summer and try his hand in the NBA, particularly if he can earn the guaranteed money of a first round pick. The list of players who could potentially still be in college is astounding, particularly when you look at those who should still be in college, rather than wasting their time at the end of an NBA bench, just waiting to be waived, is amazing. Of course, to balance this, one must also consider the players who stayed too long in college, to the extent that it damaged their professional prospects. While one might question how good Jones, or Austin Rivers, or any of the Kentucky team that has just won the national championship, might be at the professional level, there are those who perhaps could have already gone to the NBA and now see their stock dwindling: Mason Plumlee at Duke being a prime example of this. Alec Burks, Kyrie Irving, Brandon Knight, Kemba Walker and Derrick Williams from last years draft; John Wall, Derrick Favors, DeMarcus Cousins, Xavier Henry and Eric Bledsoe from the year before; Tyreke Evans, DeMar DeRozan and Jrue Holiday from the year before could all still be playing college basketball. 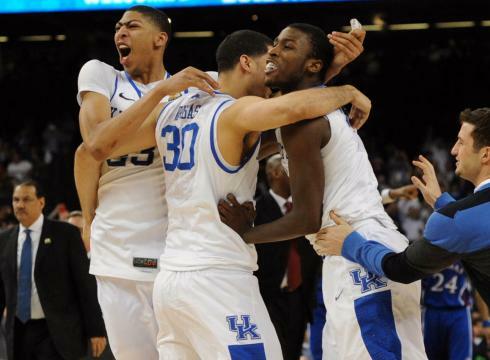 Of course, one only needs to review the reaction to Kentucky big man, and projected number one overall pick, Anthony Davis landing awkwardly on his knee to understand why these guys all wanted to play in the NBA. They are not trained, or prepared to do anything else. If basketball doesn’t work out for them, there are not a whole lot of options. But that doesn’t mean we can’t lament their absence from the college basketball scene. Russell Westbrook Anthony Davis Double Dunk! Thanks for inotrdcunig a little rationality into this debate.